Balsamic di Modena: Why Is This Authentic Italian Food So Darn Expensive? We’ve all heard people rave about balsamic vinegar. With a wink your foodie friends will share “the good stuff” at dinner parties on everything from nuggets of parmigiano reggiano cheese to pasta bowls. One drop of aged balsamic takes whatever you’re serving to new heights. Authentic balsamic di Modena is made in Modena, Italy, a small town in the Emilia Romagna region, where local families continue the age old tradition of producing DOP balsamic in the attics of their family homes. DOP stands for Protected Designation of Origin as regulated by the Italian government. It is one of Italy's unique regional foods and one of the authentic foods you have to try when you're here. Balsamic is made from cooked grape juice. There are no skins involved and no fermentation process involved as in wine. 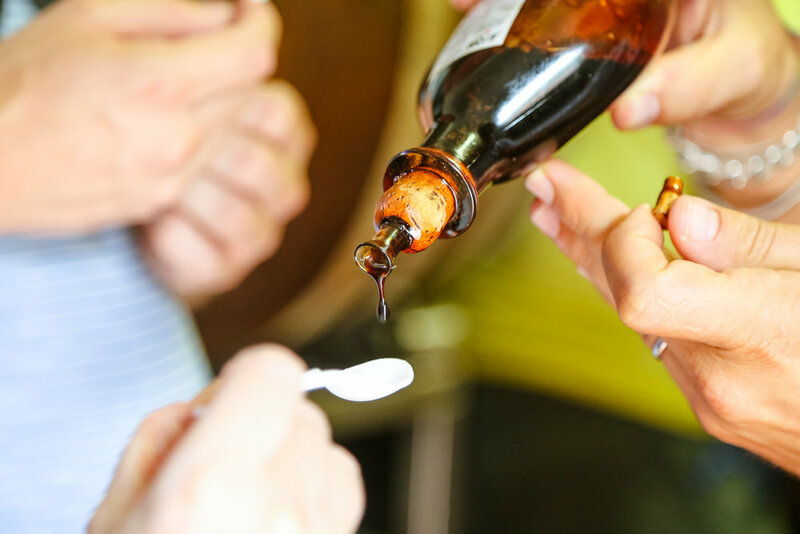 We first learned the process of making balsamic di Modena when we visited Villa San Donnino, a small family-run operation in Modena on a day trip from Bologna. This year, we visited one of the oldest and largest balsamic producers in Modena, Guiseppe Giusti. But why is it so expensive? Tiny bottles of Balsamic di Modena sell upwards of a few hundred dollars. Yes, you heard me right. So you'd better savor that drop, because it just cost you $10! Authentic balsamic is aged in small wooden barrels. For a really long time. The “good stuff” sits in an attic for 25 years, a few pipettes occasionally being syphoned off and added to progressively smaller barrels containing older balsamic until many years later the end result is a viscousy liquid similar to a syrupy reduction you’d make on the stove. It’s a waiting game, and a pretty amazing one at that! Think about it for a moment. What other food can you think of that sits and ages for more than two decades? Think of the life that goes on around it while it just sits in the barrel for a quarter century. Children grow, parents age, children marry, grandchildren are born, and all the while the liquid sits, and ages. It’s no wonder balsamic barrels are often given as dowries here when a daughter marries - because the one who started it may not live to see it. Like people - the rough edges and harsh notes of young balsamic eventually mellow with time, ultimately creating a product that’s so hard to qualify, you just can’t call it vinegar. Aged Balsamic di Modena has intense, well-developed flavors, with no harsh notes and an unexpected sweetness. Like a fine wine, aging and maturing yields something almost indescribable. If you still think balsamic is not worth the cost, I’m afraid you may have missed the point. Balsamic di Modena is not a luxury item, but rather an investment. To Italians, having a bottle on the table is a necessity of life, because a drop is all that’s needed. Like icing on a cake or the cherry on top. The small bottle will last for years. One little drop of the well-aged liquid gold makes whatever’s being served taste that much better. It’s worth every penny, euro, peso, or rupee you can muster spending. Because it’s more than just a food product. Balsamic is life - with all its ups and downs, war and peace, the growing pains and labor pains, the hellos and goodbyes, love and life - in a bottle. If you live outside of Italy, it's difficult to find authentic balsamic that's not fake. In many cases, the balsamic vinegar we get in the US from grocery stores and the dedicated "gourmet" olive oil and vinegar shops is just grape juice with a little vinegar, caramel, and artificial coloring and flavoring added. Traditional Balsamic Vinegar of Modena - “Aceto Balsamico Tradizionale di Modena” - is only produced within the town of Modena in Italy from white and sugary Trebbiano grapes harvested as late as possible to take advantage of the seasonal warmth nature provides. It is made from the cooked grape “must” and aged for a minimum of 12 years or 25 years. This post contains affiliate links: which means if you make a purchase through our links, we earn a small commission at no extra cost to you. After all this drooling over balsamic, you'd be disappointed if you could only buy the good stuff in Italy, right? I know how you feel. We brought several bottles back with us from our first trip to Bologna and hoarded it like it was made of gold! But we’ve recently found some of our favorite balsamic vendors online - hallelujah!! Authentic Guiseppe Giusti Balsamic di Modena is now available online through Amazon, from a 2-pack balsamic reduction, single bottles, 2-packs of their Aceto Balsamico, or a full set of four bottles to gives as gifts or keep for yourself! Check their full selection and prices.